Squirrel, don’t you mock me! How dare you mock me every morning with your screechy laugh. 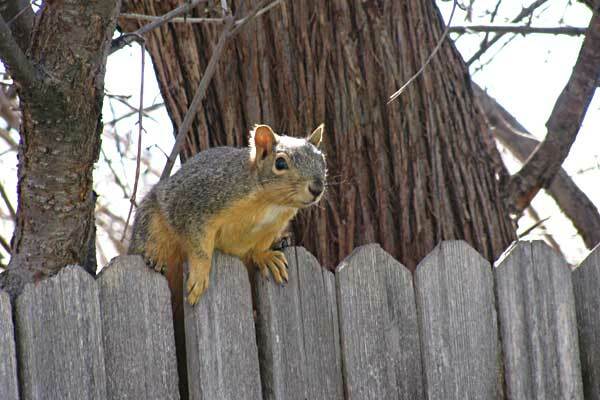 Twitching your tail at me from the top of the backyard fence! What? 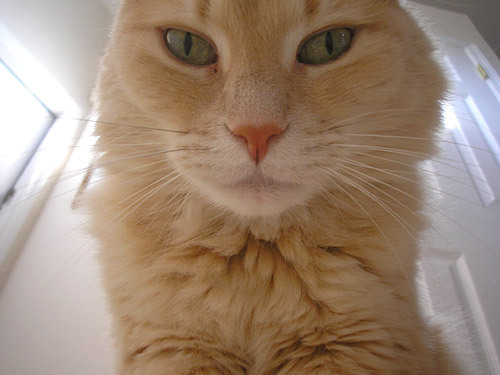 You got fleas?!?! Let me esplaeeeeeeeeen, mija! In the great scheme of things, you are a rodent. I may look like one, but I am an ascended canine. Look that up on the food chain. I make out in that deal. I may be stuck inside, while you frolic about the great outdoors. But inside my cozy little “cage” I get 2 square meals a day, unlimited cheerios, and adoring humans ready to see to my every whine. Oh, and I get to sleep on “their” posture pedic. How’s that oak branch working out for you? And did I mention the belly rubs and kisses. You’d probably like that. But, oh yeah, you’re busy frolicking outside. Too bad. More for me. And … And … Whatever! You stink, you fluffy-tailed rat! OK, see you mañana, Chica! Same time, by the same window, same fence! Gotta run! Ciao! So Mom has a birthday coming up, though she’d keeeeeell me if she knew I’m blabbing. See, she “stopped” having birthdays 5 or 6 years ago. What does she have to complain about. It is seven for me with each passing year, Mijita!! But we won’t get into that. So one of my ever faithful fans spotted just the thing and reported from the road. Look at what he found!!!!!! 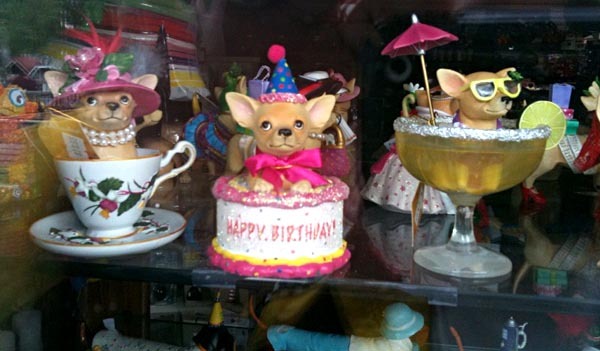 Chihuahua gifts spotted by intrepid reporter Jack Rowland on his way to Fontana Village (wherever that is?!?!) Thanks, Jack!!!! and good luck on the race. They are perfect: Chanel the teacup princess, Chanel the icing on your cake, and Chanel the life of the party!! Whaaaaaaat?!?!?! You know I’m right!! And because I just can’t choose, it is all three for Mom!!!!!! You can never have to much Chihuahua in your life!!! Love you, Mom! As the smallest member of my family, I learned quickly about two things: scrounging at lightning speed and eat first, ask later tactics. It is a survival instinct proundly handed down in my family now for generations. 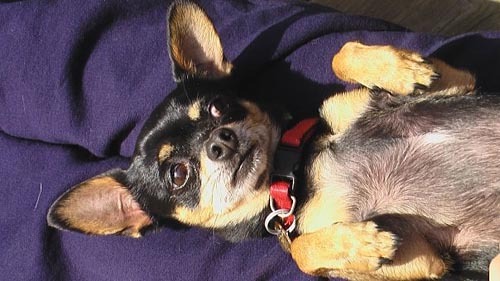 So in the spirit of good will, I thought I’d share a little Chihuahua wisdom on tactical maneuvering. When Mom is making tacos – Mmmmm shreaded cheese raining down from the counter. Turkey sandwiches by Dad – he tends to go overboard. Guilt is a fabulous tool. Cheerios – anytime I hear the yellow box shaking. Late night snacks – this is when I find the intense stare works best on the debilitated humans. The kids are the easiest because they know they are not supposed to sneak food into their bedrooms. I’m doing this for their own good. When Dad is making soup – onions, yuck!!!!! Actually, any time Dad us cooking – them’s big feet to scurry around. So good luck, friends! I think I hear the sweet clickety-clack of Mom’s shoes in the kitchen. Gotta run! Ciao! 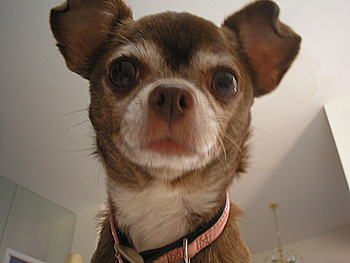 Mami – this is my Chihuahua mother – aka Cosita. 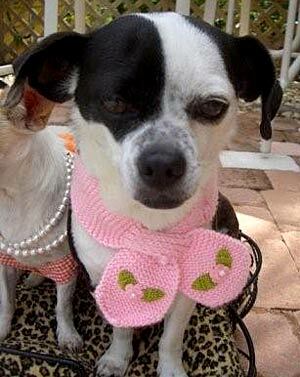 She is originally from a very chichi pet boutique in Palm Beach, Florida. Always fabulous in her pearls, her favorite pastime is lounging by the pool. 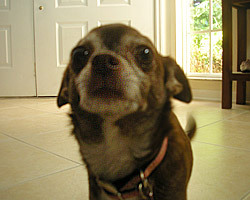 Papi – this is my canine papa – aka Coco. I take a little after him, thus my very appropo name of Chanel. My handsome Papi is the family peace keeper. Surrounded by high-strung, high-maintenance females he somehow manages to stay calm, cool and collected. Just don’t mess with his squeaky toy frog! Cha-Cha – is the eldest sister. Let us say she is the “healthy” girl in the family. We leave it at that because she is rather sensitive about her size. Then again, she does have that bovine coloring to accentuate the issue. Naturally, she is perpetually cranky but I always manage to remind her of who’s boss when I visit. Cha-Cha may be the older sister, but in the end, I’m the diva in this family. Cha-Cha has a bit of an underbite and a look all her own. Like me, she was one of the first litter. As the last born of that bunch I may be the smallest but I prefer the terms petite or delicate. Lovey – well, she is my younger sister and one of the nicer of the bunch. 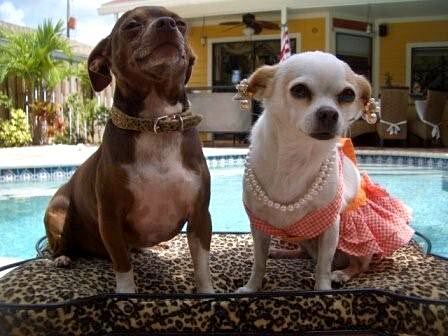 She and Cha-Cha live in Jupiter with our parents. Lovey has the longest tail in the family and the longest body. But I can still see the family resemblance in her face. However I have no idea where those ears came from! 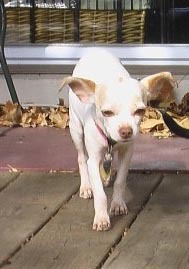 In my previous post, you met Juanita who lives in K.C. She looks a lot like Mami. She and Lovey were from the second litter. And lastly there is Panchita, the step sister with the funky walk, Ratatouille nose and sneaky ways. Confused? So am I! Altogether, I have 9 siblings, but who can keep track. So stay tuned. Ours is a close family with lots of flavor – loud, demanding and full of opinions. So Mom went off to see her other daughter (the human one) at college in K.C. I guess I must share. And in the process she got to see one of my sisters, Juanita, and the wannabe step sister, Panchita. 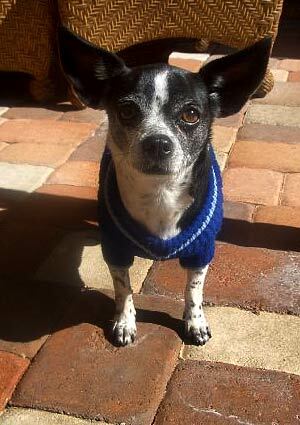 Don’t get me wrong, I’m all for pet rescue, and in particular chihuahua rescues. But my sources tell me that this particular infiltrator is crafty. She has a funny walk that she uses to get attention. Oh, yeah, “poor puppy,” my foot!! As they say in my country, “sabe mas que las cucarachas!” (she knows more than the cochroaches!) And she is sneaky like one too! But I don’t want to be ugly. I’ll let you judge for yourself. Anyway, once she knows she’s gotten to the poor unsuspecting human, that’s it! She turns on all the charms, tries to get all the treats, hogs the lap, and wants all the belly scratches. That would not work so well in my kingdom! My poor sister Juanita who worked so hard at her poor-shy-delicate-flower act, is having to jump through hoops to get into that circus act. So I’ll do my best to counsel my little sis from here. Sister, I say, I have two tips for ya: mysterious wet spot on the carpet + that innocent look you do so well = Panchita in the dog house. Case closed! Oh, and by the way, Mom, you have a lit of essssplaineeeeng to do! How come you didn’t take me to K.C. to visit my hermanas? I thought you said you were going to “work.” I’m not buying that line again!! I pretty much set the pace for the day in my household. To illustrate, I’ll share the parallels between my activities and those of my humans. Alarm goes off -> I yawn, stretch then get my belly scratched -> Mom scratches said belly and tries to explain something about having to get up. Not an issue that concerns me, but eventually I humor her and play along. We get out of bed -> I get carried to the kitchen where my bowl is filled even before the cat’s -> mom makes coffee ( Cuban and strong) and breakfast for the family. When she does sit down to eat hers, I get my second breakfast of cherrios flicked through the air for me to play “fetch” which I do fetch but of course never return. I’m ready for my morning nap -> Mom gets ready for work all the while giving me kisses and reassurances that she’ll be right back. I just put on the “Bambi” look and bask in the love. Yawn! I think I need a snack -> Dad conveniently comes home from work to have lunch but he easily falls for the tail wagging and cute prancing. Mmm, mmm, mmm! I love that Publix rotisserie “mojo” chicken! Hmmm, I’m hungry again -> Mom comes home from work. Dinner! YES!!! I’m ready for lap time and serious adoration -> Mom and dad watch their favorite shows. I get front row seats. Isn’t it getting late? I think it is time for bed. A little whining. A little pawing. The “Bambi” look if need be. -> lights out and we are off to bed. Mom and Dad get comfy. I crawl under the blanket for my well earned beauty sleep. Have I mentioned that I have a big brother? He is adopted, a lot hairier than me and a bit fickle. Then again, he is a cat. His name is Tigger, though I think they missed the mark there. I see him more as a “Killer” or a “Muffasa” perhaps even “Predator” at the very least “Tiger!” I can attest to his sharp teeth, mean left hook and multiple personality disorder. Oh, he can come in handy — he loves to knock things over, and that sometimes leads to snacks for me. He gets wicked pleasure from pouncing on smaller creatures. And sometimes that includes me. I can never tell what is going on in his head. But when I see “the look” (as seen in the picture above) I stear clear and send the bat signal for Mom to come get me. But as he has a peculiar advantages — he can leap tall furniture in a single bound, is faster than any speeding bullet I’ve ever seen, and he is definitely more powerful than the vacum cleaner (no way anyone can keep up with his hairballs,) I’ve decided to keep him on the the team. You know, keep your friends close and your enemies closer. So he will now be an official contributor to this blog. Besides, I score points with Mom if we play nice. You are currently viewing the archives for April, 2010 at Chihuahua Wisdom Blog.